Just ask yourself this simple question - when the hell did you ever get honored for anything? Now bow the MF down. 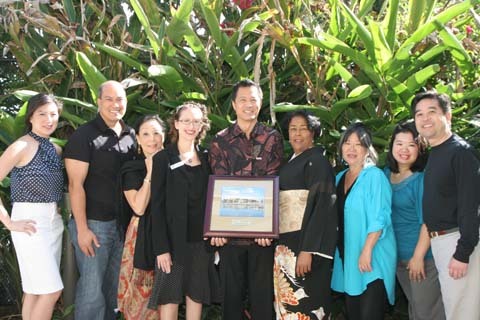 East West Players (EWP), the nation’s premier Asian American theatre, was awarded the Heritage Award at the 9th Annual Autumn Festival on Saturday, November 6, 2010 held at the Aquarium of the Pacific in Long Beach, CA. The 9th Annual Autumn Festival celebrates the cultures of China, Japan, Korea, and the Philippines. At each of the Aquarium’s cultural festivals, an outstanding leader in the community is honored with the Heritage Award. Cecile Fisher, Vice President of Marketing for the Aquarium of the Pacific, was there to host the awards ceremony. Jan Perry, Los Angeles City Councilwoman of the Ninth District, presented the award to Tim Dang, Producing Artistic Director of East West Players, after she performed a Japanese dance to open the ceremony. The weekend was a flurry of activities and featured live music and dance performances, cultural arts exhibits, and children’s crafts. Throughout the weekend artisans and other vendors displayed and sold their works. Various ethnic entrees were also presented.